TL/DR: The U.S. government should modify the legal infrastructure for mineral resources such that the carbon in undeveloped fossil fuels can be purchased and reserved in perpetual easements. I am a carbon mitigation skeptic. That is, I doubt the social and technological tools at our disposal can avert the next hundred years of likely anthropogenic climate change. Without a breakthrough in energy production, free CO2 capture, or both, atmospheric concentrations of CO2 will remain high enough to continue to force global warming. Despite the optimistic claims of the pro-mitigation establishment, as represented by the International Panel on Climate Change, the climate problem is, at the moment, an insoluble one. That is, we don’t yet know the means by which we will stabilize and reduce atmospheric CO2. Solar power costs are falling faster than most observers have dared hope, but global demand for inexpensive energy, especially in the developing economies where coal is essential to continued growth, will continue to outpace our supply of non-fossil sources, which is why neither China nor India is likely to implement carbon constraints in the forseeable future. Coal is a popular villain in the climate change story, and for good reason. It’s the consumption of coal for power generation that loaded the atmosphere with carbon in the first place, coal emissions account for over forty percent of global CO2 emissions, and the growth in coal-fired electric plants will continue for the near future. As long as coal remains cheap—as long as its price excludes the externalities of carbon pollution—utilities will continue to use it rather than gas or nuclear power for electric generation. Mainstream proposals make unreasonable assumptions about the likelihood of aligning global incentives or encouraging technological investment in renewable energy sources, and plans that attempt to reconcile carbon abatement with the inevitable continued use of coal are especially guilty of such unfounded optimism. A 2007 interdisciplinary study published by MIT, for example, endorses carbon capture and storage (CCS) as the most promising way to reduce emissions from new coal-fired power plants overseas, and insists that any new plants be built with CCS. Even if the U.S. could, as the report recommends, encourage developing nations to test and implement CCS, this would only improve the emissions from newly constructed facilities, and the parasitic load of capture equipment would require more coal to be burned to produce each unit of output. Even this high-profile study from a flagship American institution advises little more than a program of wishful thinking with meager results. Reducing carbon by burning coal to power a device to strip CO2 from coal-fired flue gas makes little sense to anyone without a direct interest in promoting such boondoggles (like this writer, a few years ago), although at least one comitted climate activist disagrees. The ideal solution to anthropogenic climate change is a zero-carbon energy source cheaper than fossil fuels, and a means of using that energy to capture previously-emitted carbon from the atmosphere. In the absence of cheap zero-carbon energy, the developed economies have tried to price CO2-related externalities into the market cost of coal, oil, and natural gas, in hopes that renewable or low-carbon alternatives would become less expensive in comparison. Because coal is more carbon-intensive than natural gas or petroleum, it is the fuel source most sensitive to the imposition of carbon-based penalties, and offers the greatest potential for single-source carbon reduction. None of the various attempts to reduce CO2 emissions, such as a carbon tax or a credit trading market, have been successful in the U.S., though, partly because they would establish sweeping new regulatory regimes, and therefore invite resistance from entire industries. So, as my gift to America’s environmental policy entrepreneurs, here’s a proposal that focuses on the fuel source and sector with the greatest potential for incremental carbon abatement, could reduce emissions by about 40 percent of the reduction that a full switch to low-carbon resources would accomplish, uses currently available technology, does not require unrealistic levels of international cooperation, does not create artificial markets in ephemeral government-enforced carbon credits, and can be financed with philanthropic funds or federal spending. It uses small-bore regulatory reform to leverage private support for carbon mitigation without the political backlash that coercive regulation invites. The U.S. government should modify the legal infrastructure for mineral resources such that the carbon in undeveloped fossil fuels can be purchased and reserved in perpetual easements. Private activists and even coal-competing energy developers could buy in-situ coal with the assurance that its carbon would never be released through combustion. The government could even use its own funds to establish an “undeveloped carbon reserve” as a carbon reduction strategy. Strategically shrewd “investors” in unmined coal, motivated by the desire to prevent its mining and prop up its price, would start buying up tracts with the most economically viable reserves and continue down the supply curve, ideally until the spot price for coal meets that of natural gas. This would encourage the fuel-switching that is already underway in the U.S., thanks to the shale gas boom and recent regulations restricting coal. Additional regulations, like treating power plant ash as a hazardous waste, or the monitoring and control of mercury emissions, are likely to nudge the relative price of coal higher still. Since natural gas has about half the carbon content of coal per unit of energy, the switch to gas reduces the country’s carbon intensity, allowing us to generate the same amount of economic output for fewer tons of CO2. There’s nothing innately irreversible about this; natural gas prices could rebound and coal could regin some of its lost market share, but a shock to coal prices caused by the sudden arrival of a new market, could lock in this domestic shift, perhaps permanently. The purchased reserves would be placed off-limits to extraction in perpetuity (but could perhaps remain available for underground gasification)1. Since the U.S. contains the largest share of the world’s coal reserves, and exported 126 million tons in 2012, domestic market shifts could cause natural gas and renewable energy sources to become more competitive with coal on a global basis without the need for internationally binding agreements. Additionally, because coal deposits are so widely distributed, this policy is one that could be reproduced and extended by other coal-producing nations where policy elites endorse carbon mitigation, such as Australia. An energy-efficient system minimizes the number of state changes through which energy must pass. An elegant policy solution to atmospheric CO2 accumulation will similarly operate in as direct a manner as possible. Today, a climate activist who hopes to convert money into carbon mitgation can choose from among several different bank shots, such as political engagement, purchasing carbon offsets, or investing in alternative energy. In all these approaches, uncertainty and complexity dilute the carbon-reducing value of each dollar spent. Buying undeveloped fossil fuel and preventing it from ever being combusted results in both the direct benefit of sequestering the CO2sub> and the secondary effect of nudging prices upward by reducing coal available to other buyers. Private citizens and philanthropists could use their own funds to lock up coal reserves and corner the market, rather than lavishing money on political operatives and consultants and launching advocacy projects of dubious impact. A national or international cap-and-trade system appeals to those who enjoy sweeping, high-stakes political challenges, but it suffers from being an all-or-nothing commitment. To crudely stylize the democratic process, getting 49% of the votes means getting zero percent of the results. The money spent on developing and selling a high-profile policy solution might not be totally wasted, since institution-building can be a gradual process, but resources devoted to lobbying for cap-and-trade have yet to directly prevent any CO2 emissions. By making one rather esoteric adjustment to U.S. properry law, my proposal allows each marginal dollar spent to have some small impact toward increasing the cost of burning coal. The US federal government, through the Bureau of Land Management, is the country’s largest coal owner, with responsibility for 570 million acres of coal mineral estate. The BLM already pays lip service to a carbon mitigation mission. It’s even “exploring the potential to sequester carbon dioxide in geologic formations beneath public lands.” Treating sequestration reservoirs as a natural resource makes good sense. Given the availability of better energy sources, sequestering that carbon with financial and legal instruments before excavating and burning it makes even more sense. 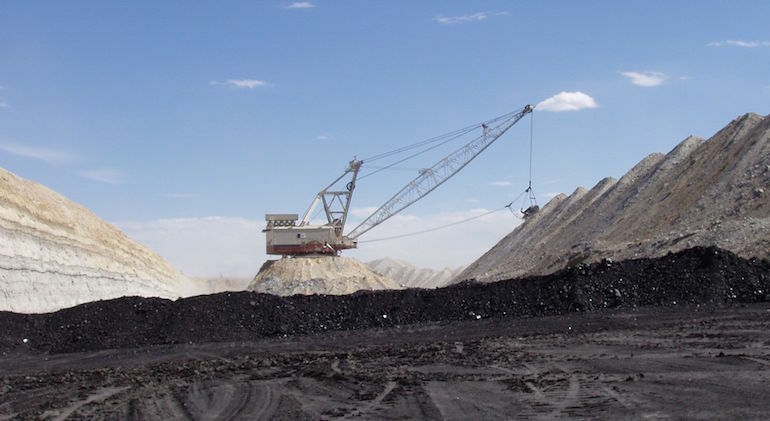 Creative legislators and regulators could develop a follow-on to the Federal Coal Leasing Amendments Act of 1976 (FCLAA), which amended Section 2 of the Mineral Leasing Act of 1920, and turn “carbon easement” into a type of coal lease, and integrate it into the BLM’s competitive leasing process. A new market for BLM’s coal would arrive just in time, since the agency can’t seem to find any buyers at current prices. A single bid of $0.21 per ton for a tract of Powder River Basin coal was rejected in 2013, so that coal stayed in the ground for another year. Let’s stop for a minute and look at that failed lease bid. The bidders offered $35,070,331 for 167 million projected tons of coal. Using the EIA’s conversion factor of 1,685.5 kg of CO2 per short ton of subbituminous coal, that works out to 281,478,500 metric tons of CO2. $35 million divided by 281.5 million works out to $0.124 per metric ton of CO2 abatement. Terrapass, meanwhile, will happily take $13.12 of your money in exchange for offsetting a metric ton of CO2 emissions. These costs are not, of course, directly comparable, since the government expects royalties on the mined coal as well as the lease price for the unmined acres, but the spread between the cost of in-situ coal and the cost of standard offset schemes (biogas digesters, etc.) is larger than I expected, and encouraging the BLM to forgo its royalty payments in exchange for carbon sequestration isn’t unimaginable. Buying up prime coal reserves and rendering them off-limits to mining would cut the coal mining industry off at the knees. This is a feature of any meaningful carbon abatement plan, though, since CCS is still both unproven and expensive. A tough regulatory environment is already preparing the battlefield by whittling away at the domestic market, so my proposed buyout may look, in comparison, like a more graceful exit for coal owners. Natural gas producers would stand to gain, as would the holders of those coal reserves left on the open market, at least in the near term. Increasing the market price of coal increases the economically recoverable reserve base. Technological progress that lowers the cost of mining could undercut the government-bid price, and mining companies could leapfrog over the off-market reserves to previously less accessible deposits. Gas prices are volatile, and could become higher than coal if the unconventional gas boom dies out or the supply is diverted away from generation for export purposes. Coal will remain popular overseas, especially in Asia, even if U.S. buyers tweak the price upwards. Additionality can be a problem: if the coal was never going to be mined, there has been no incremental CO2 abatement. Allowing easement buyers to help the coal market clear, however, would still reduce perceived supply and support prices. What would be the macro implications? How much money would this take? How much would it move prices? I have taken some well-deserved grief on twitter for the absence of numbers in this proposal. As I explained, the necessary values for a back-of-the-envelope guess aren’t readily available, but I owe the reader some ballpark figures. Here are some tentative steps toward providing the variables that would make up an economic model of my plan. The cost of unmined coal isn’t published the way different index prices are, but the per-ton royalty rate paid by a mining company to the mineral owner is a good proxy. The royalty reflects the value of the coal before any downstream services like extraction or transportation have been performed. To compensate a mineral holder for rendering his or her resources unmineable, the retirement price of the coal would have to match or exceed the present value of the expected royalty income. The BLM charges 12% per ton of surface coal and 8% per ton of underground coal. A ton of Powder River Basin coal that sells for $12 will earn the federal government a $1.44 royalty payment. Using the EIA’s conversion factor again, that $1.44 could have sequestered 1.7 metric tonnes of CO2. Terrapass, remember, charges $13.12 per tonne. As of October 2014, PRB coal cost Alpha Natural Resources around $11/ton to mine. 1/15/2016 The Department of the Interior announces a Programmatic Environmental Impact Statement (PEIS) to review the federal coal program. This freezes all new leases while the review is under way. 10/30/2015 MIT’s Technology Review mentions the scheme favorably. 10/15/2015 This Grist.org post about Greenpeace buying German lignite is kind enough to link to this page. 11/2/2015 My friend Michael Brendan Dougherty has helpfully explored the political appeal of this scheme. 10/29/2015 Welcome, Atlantic readers! Big thanks to Robinson Meyer for mentioning this idea in his feature article, Buy Coal Now! 9/25/2014 Two different publications mention my scheme today, How Wall Street Really Is Failing The Planet, by Ben Walsh and This plan to stop global warming is so crazy it just might work, by Pascal-Emmanuel Gobry. Momentum!